A solid set that will add new sounds to your arsenal. Good sounds. Welcome customisation options. Loading into its well-established - and free - UVI Workstation engine (VST/AU/AAX/RTAS/ MAS/Standalone), Retro Organ Suite is a 4GB (7GB uncompressed) multisample bank that encapsulates the sounds of a range of classic electronic organs in six separate instruments. Specifically, they comprise Hammer B (Hammond B3), Super VX (Vox Continental), Retrocorda (Philips Philicordia), EX III (Korg CX-3), GT2500 (Eminent Grand Theater 2500) and Combo K, (combining the Farfisa Compact Duo and Combo Compact, Elka Classic, Philips AG7500 and Hammond M100). The source organs were kept as authentic as possible throughout the recording process, with their original speakers, vibrato, percussion and other elements - over 20,000 samples in total. 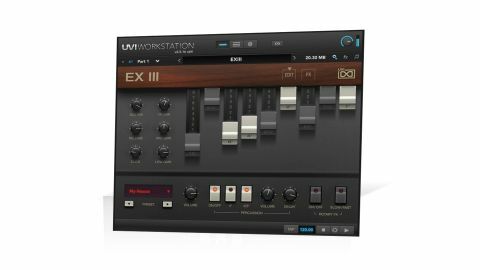 As is always the case with UVI's multi-instrument libraries, the six Retro Organ interfaces aren't actually as different as they first appear. All of them share a common FX page, housing a board of seven virtual guitar pedals (distortion, delay, reverb, etc), while the Edit pages of all but EX III give access to the same array of parameters - multimode filter, amp and filter envelopes, tremolo and vibrato control, and mod wheel filter modulation depth. The Edit page for EX III (which comes in monophonic and polyphonic versions) has a set of nine adjustable drawbars instead - it's the only one that actually lets you get hands-on with the harmonics. The differences between the organs become apparent in their Main page controls and, of course, the sounds of the samples behind them. Hammer B, GT2500 and Combo K are dual-layer, for example, with their variably sourced and processed layers mixed and matched in the Main page; while Retrocorda instead offers seven preset voice combination buttons in 'Normal' and reverb/vibrato alternatives. It's obviously important to understand that Retro Organ Suite isn't trying to be a purist recreation of the original instruments it represents, and isn't trying to be an algorithmic 'emulation' instrument exactly; rather, it's a sort of 'reduction' of these, designed for quick and easy access to the legendary sounds for which they're known, with enough customisation to keep tinkerers happy. Approached with that in mind, UVI's nostalgic sextet makes for a sonically expansive and satisfyingly playable arsenal of faux organs.